Leaf lettuce - The time has already passed for this cool season crop, but fall will be here before you know it. Lettuce is great for beginners because you can't do anything wrong and you get to harvest a month after planting. One of the easiest to grow in our area is Black-seeded Simpson, but I like to mix in a red variety for eye candy. 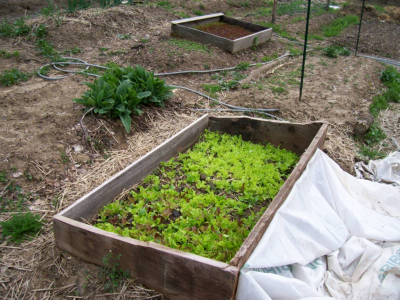 Read all of my tips on growing lettuce here. Swiss chard - Most greens are extremely easy, but Swiss chard takes the cake. Unlike other greens, swiss chard doesn't get bitter, nor does it bolt the first year. The greens are mild in flavor and can be substituted in recipes which call for spinach (a vegetable that does bolt quite quickly.) 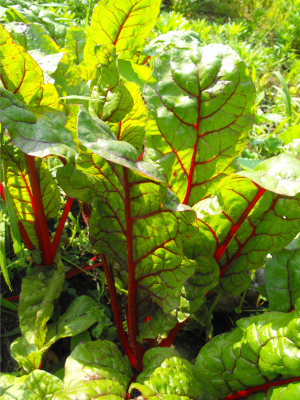 Although they taste the same as the white-stalked variety, urban gardeners will love Swiss chard varieties with leaf stalks ranging in color from white to yellow to red since they're pretty enough to mix into your flower border. This warm season crop should be planted after your frost-free date --- for nearly all of you, that means you can go ahead and plant now. Once the leaves are four inches tall, I start cutting them just like leaf lettuce once or twice a week, making sure I don't cut the growing bud, but taking most other leaves. Tomatoes - In my opinion, tomatoes are really a year two crop, but the flavor difference between a homegrown tomato and a storebought one is so great that few people can resist planting them. For the raw beginner, you should go ahead and buy a transplant or two from the feed store and put them out after the frost-free date. Choose a slicer or a tommy-toe (or both). Be sure to cage or stake your tomato, and if you're starting this year, I highly recommend pruning since the blight is still in the air. 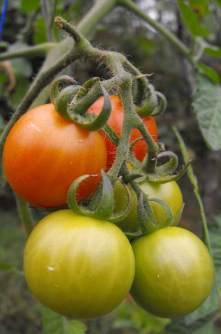 In later years, I think you'll be happier starting your own tomatoes from seed and growing primarily romas for ease of storage, but in year one you should stick to simple vegetables that go straight on your plate. Basil - I see people buy basil transplants, and I can't figure out why. Basil is the easiest herb you can grow --- throw the seeds on the ground around your frost-free date and you'll be picking off leaves a couple of weeks later. The trick to a summer-long harvest is to cut your basil back regularly (at least once a week) and never let it bloom. With lettuce and swiss chard, I told you to be careful not to harvest the central growing bud, but with basil I advocate the reverse. Cut the whole top off the plant, leaving one or two pairs of older leaves at the base, and it will branch out into a bush. Keep cutting the youngest, tastiest leaves, and your plant will just get bigger and bushier. When the basil does start trying to bloom, pick off the flower buds. I recommend a simple Sweet Italian or Genovese basil for your first year, but later you can branch out into the varieties that taste great in other ethnic foods. Sweet Corn - The only major thing that can go wrong with corn is lack of pollination if you plant too small of an area. I try to plant at least two short rows together, and three or four are better. Your corn will mature nearly all at once, so for a full summer harvest, I plant a bed on our frost-free date, and continue planting another bed every two weeks until the end of June. 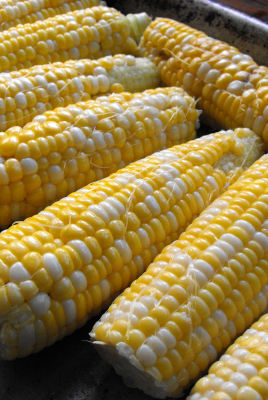 Like tomatoes, there's no comparison between homegrown and storebought sweet corn. But this is the one vegetable where I like to stick with fancy hybrids --- heirloom varieties are starchy instead of sweet. Okra - Okra may seem like an odd choice for the beginner, but in the South few crops beat its ease of growth. In fact, the plant has such huge, beautiful flowers that okra can easily pass for an ornamental. Plant the seeds at the frost-free date, and in a couple of months you'll see blooms and little, furry fruits. Cut the whole fruit off at the stem when it is less than three inches long and steam it --- the trick to defeating okra slime is to never let water touch the interior of the fruit. We eat our steamed okra with our fingers, holding it by the stem and eating the fruit portion off, but you could cut the tops off after steaming them if you like. The traditional method of eating okra is to slice, batter, and fry it, but I can't really recommend that approach. Our favorite variety is Clemson Spineless. The beginner should pick two to four of these varieties to try out their first year, steering clear of okra if you live in the north and of tomatoes if you live in a very hot area like Texas. Plant a very small garden, no more than perhaps 100 feet square, and mulch the whole thing if possible to cut down on weeding. If you have anther choice, steer clear of pots, which are harder than they look, and keep good records of when and where you planted and what happened. Most of you still have time to start something this year, so go do it! Oddly enough I have a lot of trouble with basil, only getting a plant big enough to harvest around the end of the summer. This was not true in my previous locations so it may be a location issue. Plants that I would submit as easier than basil, but generally better to purchase a small plant rather than seeds. Rosemary, oregano, thyme. beans are crazy easy for even little kids to start from seed. That's exactly the kind of feedback I was looking for --- thank you! You're actually the third person who's said they've had trouble with basil lately, which makes me think I might just have a microclimate that makes it easy. Perhaps it's our raised beds? I'd be curious to hear from other people about how basil grows in their neck of the woods. I consider beans a year 2 crop. I agree that they're very, very easy...unless you get bugs. We seem to be very lucky in that the bugs stay in check, but most other folks report that their plants get defoliated in short order. Have you had trouble with insects on your beans? Rosemary, has been a perennial for me up into southern CT and in MD it easily becomes a 4-6 ft bush. Oregano, while it is a perennial goes 'wild' after 2 years unless very vigourously trimmed and loses all flavor, so I usually treat it like a biannual, digging it out at the end of 2 years and planting new. I have never really had trouble with leaves of beans being eaten. In CT I did have trouble with the stems being bored through, mostly when the plant is relatively young. Putting a little aluminum foil around the stem fixed that problem. I actually think the basil thing might be more about micronutrients than about climate as it did better in the sun/shade of CT than in the sun or shade of MD. And in one place in MD it was much better than in another place, maybe it is soil pH sensitive. My guess about rosemary is that zone 6 is slightly outside its hardiness zone. It will grow into a huge, beautiful bush in cities where the asphalt mitigates winter cold (which, in my opinion, really makes these areas zone 7), but dies in the country. At least that's been my experience around here, where folks in town can grow it fine, but all of my efforts to keep it alive over the winter fail miserably. I'm intrigued by your oregano experience --- that could explain a lot! I agree with Errol on the basil - I plant three or four plants and end up with a basil hedge by the end of summer. My problem herbs are thyme and rosemary, neither of which will overwinter in our area and neither of which seem willing to grow in pots for me - it's very exasperating, since those are two of my favorite herbs to use in cooking! I think I would go with beans over corn as a good starter vegetable: they're easy to grow, easy to harvest, and there are a ton of varieties to choose from. Ask other local gardeners what variety does best in your area and you'll probably end up with some that can withstand a little bug damage (if you happen to hit a bad year for bugs). In my experience, many bean pests are also pretty easy to pick off and dispose of; I wish we had chickens to feed them to - I have to throw mine in the pond for the fish! Corn, to my mind, is best left until one has one's bearings in the garden: it needs quite a bit of space and it's harder to know exactly when to pick it. I agree that the modern hybrids are a bit more forgiving, as far as sweetness goes, though. But I can't quite bring myself to give up my Stowell's Evergreen - it's beautiful (bright pink silk! ), and produces the sweetest and most tender corn I've ever eaten - I just have to have the water boiling before I go out to pick it and shuck it as I'm walking back to the kitchen! It also never quite fills out for me, so we mostly freeze it and enjoy it's summer-sweet taste on its own or in soups during the winter. I've never tried growing swiss chard, but you just made my day by noting that it can be substituted for spinach! Spinach is one of the things I'm most likely to give in and buy at the store when my own bolts - I'm kind of addicted to it and am always putting it in soups and casseroles - so now I know what to plant so I can keep eating from my garden! Thank you! Interesting to see another vote for beans. I agree that bean beetles are very easy to pick, which does make them much less of a problem, especially if you're willing to patrol once a week early in the season before they reach epidemic proportions. In my opinion, you can really substitute any green for any other if they're cooked. Kale is a good winter substitute for spinach. had excellent luck with beans corn (accidental) and kale turnips and collards from seed last year (my first year). garlic has also been extremely simple although i dont know when theyll bulb enough to harvest. i got about 20 corn in one square foot from some stuff i buried (a foot deep) when i was running ahead of my worm boxes capacity. planted the greens in the hot season (not recommended) and they did great for 3 months until bugs turned them to lace. no other bug issues, but i live in the city (KY) so there may be ambient pesticides. mostly had transplants last year (tomatos peppers, cucumbers, etc) but essentially everything at the greenhouse was 50-75 cents so im not sure i see the cost issue. boxcar willie tomatos are awesome!